Download Heroes of Hellas 2 - Olympia for free at FreeRide Games! In Heroes of Hellas 2: Olympia, you are tasked with collecting resources and building a vast city at the location of an ancient civilization. 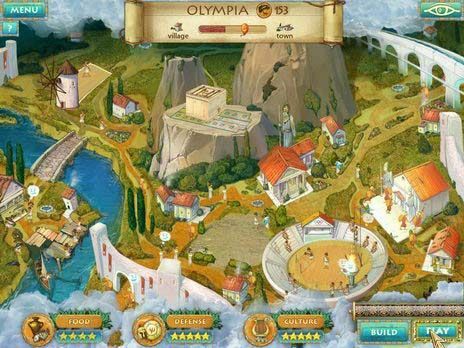 The game is based on familiar principled of Match 3 gameplay and as you progress through the various levels, you earn different kinds of resources, which allow you to build the city of Olympia and restore its 3 most important aspects: Food, defense, and culture. 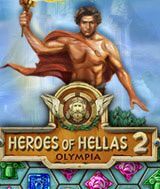 Heroes of Hellas 2: Olympia challenges you to drag your mouse across chains of identical items to remove obstacles, activate bonus items and collect valuable objects. Between levels, you can play one of 8 mini-games and spend the gold you earn on upgrades for your city! The game is beautifully rendered with hand-drawn backgrounds, smooth animation and a vibrant soundtrack that's totally conducive to re-building a magnificent city from the ashes of a fallen civilization. Get ready for pure, addictive entertainment!